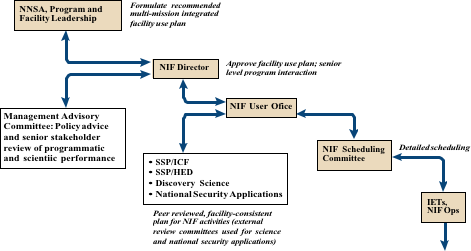 The organization for NIF Governance is outlined in Figure 2-1. The governance process allocates time to four majormission areas: Stockpile Stewardship Program (SSP): Inertial Confinement Fusion (ICF), SSP: High Energy Density (HED), Discovery Science (DS), and National Security Applications (NSA). After the governance process allocates time and produces a detailed schedule, the execution of experiments and the production of data is the responsibility of facility operations and a program’s integrated experimental team.